It never fails. Just when Dave at the office starts bitching that I haven't updated (I was on an 11-day weekend, dammit! 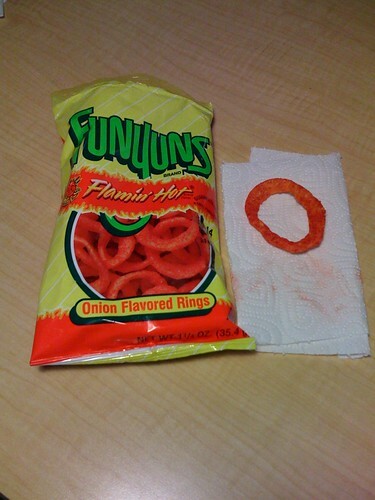 ), I go to the vending machine in the kitchen and I'm presented with something like Flamin' Hot Funyuns. The existence of Flamin' Hot Funyuns had been foretold to me by my friend Euphenia but, try as I might, I had not found them at any stores I regularly visit. I saw them at a party store by my old flat a while back but I was hanging out with my girlfriend at the moment and didn't feel like subjecting her to my vile breath. This is a courtesy I do not extend to my professional colleagues, so I peeled open the 35.4-gram bag, knowing that the cup of coffee I'd just finished was sure to make things interesting. Flavor-wise, the bright red "Flamin'" powder seemed to cancel out the "onion" taste I love so dearly, but the exciting after-burn (not the kind you get in the bathroom) was definitely present. Perhaps the coffee was masking the flavor. As I ate on, the Flamin' taste grew but the Funyun flavor did not. A similar experience is had when devouring Flamin' Hot Cheetos, and I imagine this can be said for anything else in the Flamin' franchise. There's really not that much to say here, and that's only partially because I am filling my face with spicy deliciousness. I would gladly eat the hell out of Flamin' Hot Funyuns. If you know me, you know that goes for regular Funyuns too -- When conditions are right, I have been known to eat a $2.99 bag of Funyuns, a king-size Snickers ice cream bar and a frozen Coke, after all. A note to my generous colleagues: The "item" you left on my desk should appear here next week as soon as I feel like eating bugs. IT'S BEEN SIXTEEN DAYS! WHEN CAN I LEARN ABOUT MORE WEIRD FOOD? !